Of all the amazing technologies humans have developed, none has matched the complexity of the fundamental building block of nature: the living cell. And none of the cell’s activities would be possible without thin lipid membranes, or bilayers,that separate its parts and regulate their functions. Understanding and controlling bilayers’ properties is vital for advances in biology and biotechnology. Now an interdisciplinary team of Northwestern University researchers has determined how to control bilayers’ crystallization by altering the acidity of their surroundings. The research, published September 24 in the Proceedings of the National Academy of Sciences, sheds light on cell function and could enable advances in drug delivery and bio-inspired technology. “In nature, living things function at a delicate balance: acidity, temperature, all its surroundings must be within specific limits, or they die,” said co-author Monica Olvera de la Cruz, Lawyer Taylor Professor of Materials Science and Engineering, Chemistry, and (by courtesy) Chemical and Biological Engineering at Northwestern’s McCormick School of Engineering. “When living things can adapt, however, they are more functional. We wanted to find the specific set of conditions under which bilayers, which control so much of the cell, can morph in nature.”The research, published September 24 in the Proceedings of the National Academy of Sciences, sheds light on cell function and could enable advances in drug delivery and bio-inspired technology.Understanding and controlling bilayers’ properties is vital for advances in biology and biotechnology. Now an interdisciplinary team of Northwestern University researchers has determined how to control bilayers’ crystallization by altering the acidity of their surroundings. By taking advantage of the charge in the molecules’ head groups, the Northwestern researchers developed a new way to modify the membrane’s physical properties. 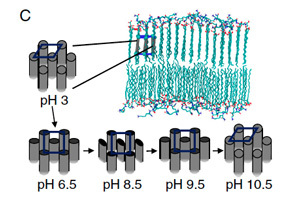 They began by co-assembling dilysine (+2) and carboxylate (-1) amphiphile molecules of varying tail lengths into bilayer membranes at different pH levels, which changed the effective charge of the heads. Bilayers are made of two layers of amphiphile molecules — molecules with both water-loving and water-hating properties — that form a crystalline shell around its contents. Shaped like a lollipop, amphiphile molecules possess a charged, water-loving (hydrophilic) head and a water-repelling (hydrophobic) tail; the molecules forming each layer line up tail-to-tail with the heads forming the exterior of the membrane. The density and arrangement of the molecules determine the membrane’s porosity, strength, and other properties. Then, using x-ray scattering technology at the DuPont-Northwestern-Dow Collaborative Access Team (DND-CAT) at Argonne National Laboratory’s Advanced Photon Source, the researchers analyzed the resulting crystallization formed by the bilayers’ molecules. The Northwestern researchers found that most molecules did not respond to a change in acidity. But those that possessed a critical tail length — a measure that correlates to the molecules’ level of hydrophylia — the charge of the molecules’ heads changed to the extent that their two-dimensional crystallization morphed from a periodic rectangular-patterned lattice (found in more basic solutions) to a hexagonal lattice (found in more acidic solutions). Shells with a higher symmetry, such as hexagonal, are stronger and less brittle than those with lesser symmetry. The change in pH also altered the bilayers’ thickness and the compactness of the molecules. Changing the density and spacing of molecules within membranes could help researchers control the encapsulation and release efficiency of molecules inside a vesicle. The research was a collaboration between three Northwestern labs, spanning five interdisciplinary departments. Other authors were Samuel I. Stupp, Michael J. Bedzyk; first author Cheuk-Yui Leung, a PhD candidate in the Department of Physics and Astronomy at Northwestern’s Judd A. and Marjorie Weinberg College of Arts and Sciences; Liam C. Palmer, a postdoctoral researchers in Weinberg’s Department of Chemistry; and Sumit Kewalramani and Baofu Qiao, postdoctoral researchers in McCormick’s Department of Materials Science and Engineering.